This morning I found a good deal for you bass players… or you guitar players looking for a little low end. It’s for the MXR M288 Bass Octave Deluxe pedal. The MXR M288 Bass Octave Deluxe pedal is a dual voice octave which gives you two separate processed and voiced octave controls. Growl is for throaty midrange octave below tone and Girth for deep smooth octave below. Additionally, there is a mid+ switch for midrange boost at a specific frequency. This pedal also uses CHT (Constant Headroom Technology) which produces 18-volts of headroom from a 9 volt power supply. 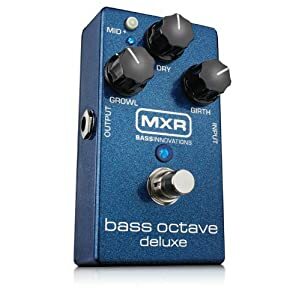 The MXR Bass Octave lists for $254.61, and is usually available for $150, but is currently on sale at Amazon for $114.22 ($35 dollars off the standard price) and also ships with FREE super saver shipping. At the time of this posting there were only 5 units left in stock. Usually, when the count goes to 1, the price will jump back up to standard pricing. So if you’re looking to pick up an octave pedal, this might be the time!